This is the tale of two waterfalls. High Falls (or Cullowhee Falls) is located just below the dam for Lake Glenville on the West Fork Tuckasegee River near Cashiers in Jackson County. 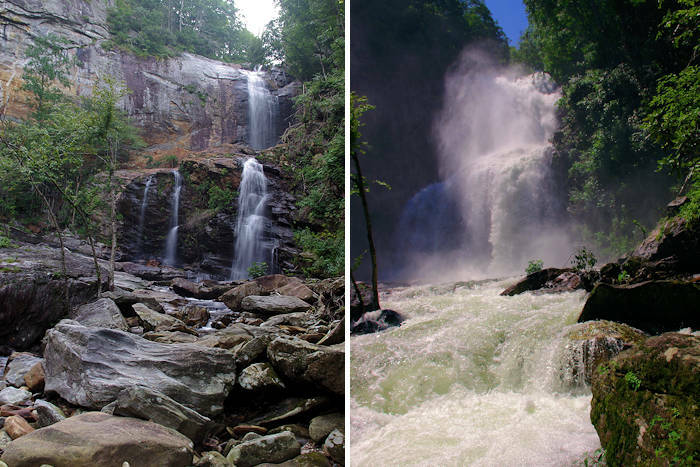 It becomes the most powerful waterfall in the North Carolina mountains for several days each year when extra water is released from the dam for whitewater kayakers. At other times, the water flow increases after heavy rain. 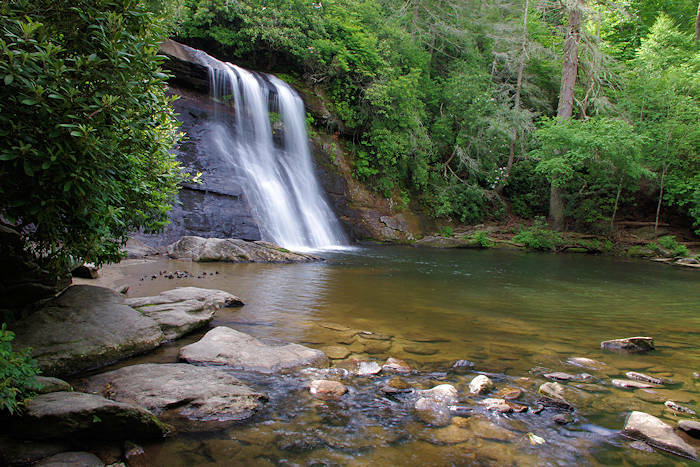 To see the big water, visit on these prescribed recreation flow days (West Fork Tuckasegee River Bypass Releases), 10 AM-4 PM: April 20-21, June 8, July 13, July 27, August 10 and August 24. But most of the time, the 150-ft. waterfall is a small stream cascading over the cliffs of the Tuckasegee Gorge since most of the water is diverted into Duke Energy's powerhouse. 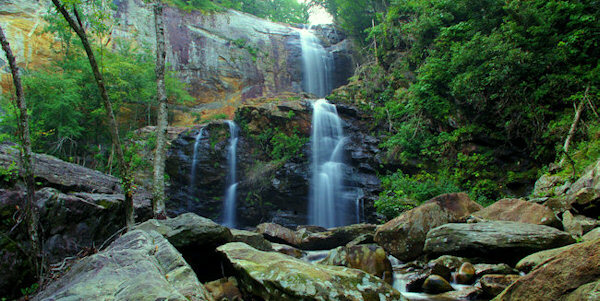 While the size and personality of the falls changes drastically like an alter ego, the setting is always spectacular! A hiking trail leads both kayakers and hikers to the base of High Falls. The 3/4-mile trail descends 650 ft. in elevation via many flights of stairs, many made of stone. So, be ready for going up and down a lot of steps. It's a strenuous hike back up, but much more fun than the Stairmaster at the gym. Watch our video of the fun! With the building of so many stairs out of area stone and logs, you'll see why it took 10 months to build! 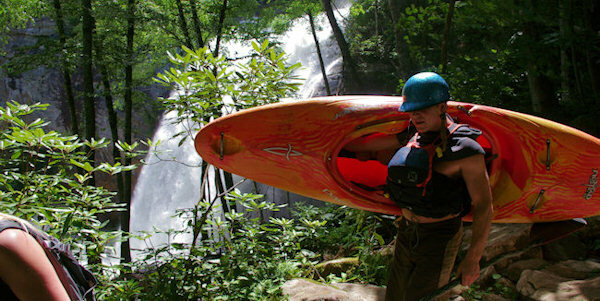 The trail was requested by American Whitewater to provide access to the six-mile river section for kayak enthusiasts. The hiking trail provides access every day of the year to the waterfalls. On most days when the water is low, you'll find plenty of rocks to climb and sit on by the towering cliffs or dip your feet in the refreshing water. Lake Glenville view from the High Falls parking area - see our Lake Glenville Guide. From Highway 107 in Glenville, take Pine Creek Road two miles to the signed "Pines Recreation Area" parking area for High Falls Trail on the right. It's past the dam (half a mile past the bridge over the dam). 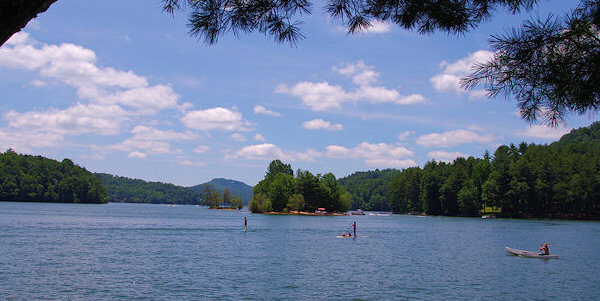 On left is a lakeside park with more parking and a beautiful view of Lake Glenville. The street address is 1966 Pine Creek Road, Cullowhee. GPS coordinates 35.198262, -83.159715. 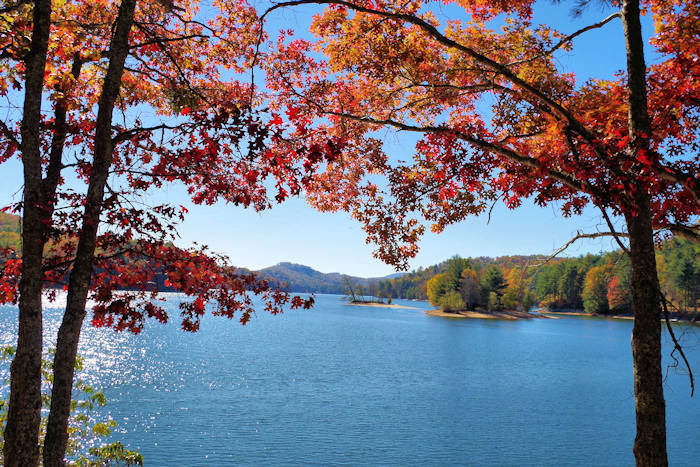 It's about 68 miles from downtown Asheville and eight miles to Cashiers. Cullowhee and Western Carolina University is 16 miles north. 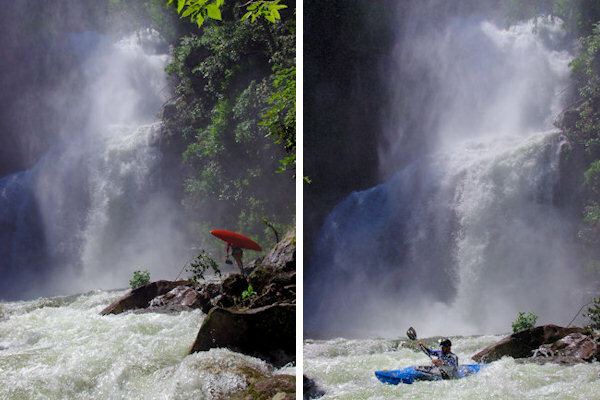 Don't even think about putting your kayak into the water before the trail ends at the base of the massive double waterfall drop. These are unrunnable drops. Paddle down the river to the newly installed take-out near the Thorpe powerhouse. It's 6.43 miles with an elevation change of 600 ft. The West Fork offers paddlers a couple of complex boulder garden Class IV/V rapids at the put-in, a big slide, several smaller slides, a standout class IV mini-gorge and many other class III rapids. To reach the take-out from the trailhead, take Pine Creek Road two miles back to Highway 107. Turn left for five miles. 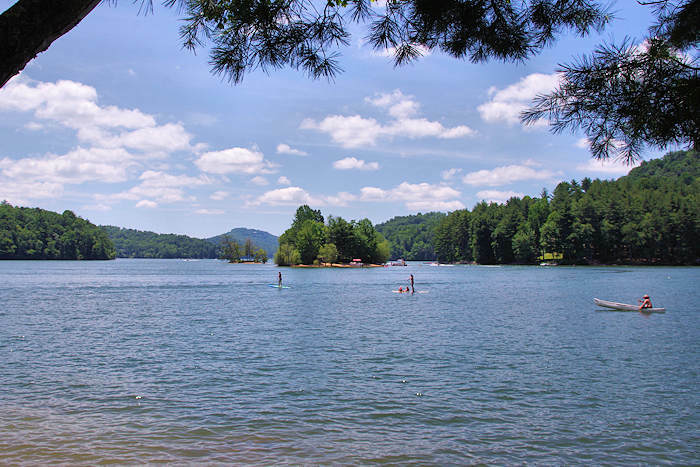 Watch for the Tuckasegee Lake Access Area on the right at the Thorpe Hydro Powerhouse. 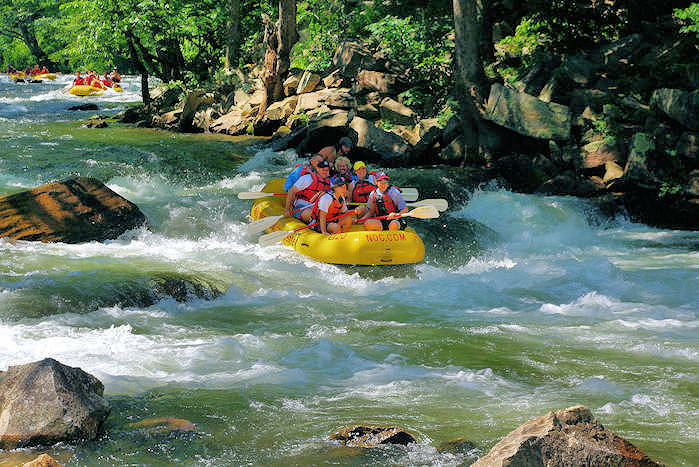 Get details of this section at American Whitewater. 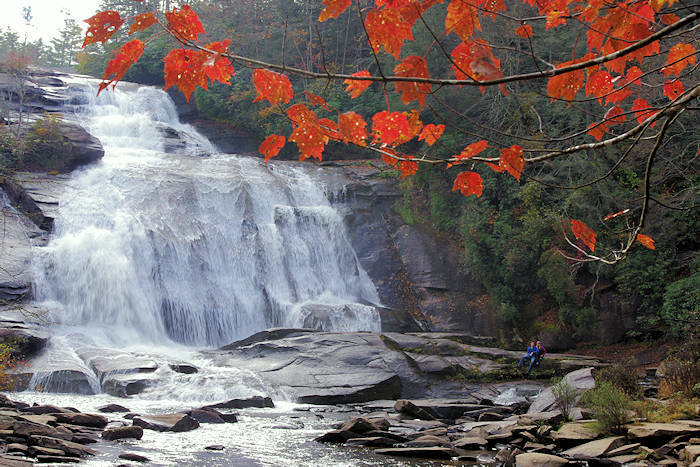 Note: There is also a High Falls in DuPont State Forest.